"...the tree guest book was such a hit! I placed the print in a frame with the glass removed. The thumbprints were made from little stamp pads I found at JoAnns. They come in a pack of 4 and are in the shape of little leaves so it was perfect, just the right size for a thumb. We set up a wet towel on a tray next to the tree, as well as a dry one, so people could clean off their thumb." You still might feel that the fingerprint idea just isn't right for your wedding guests. So here we have another lovely idea using a craft punch. Simply pre cut some coloured card with the leaf punch, there will be plenty of styles to choose from at your local art or craft shop, and have them on display on the day. 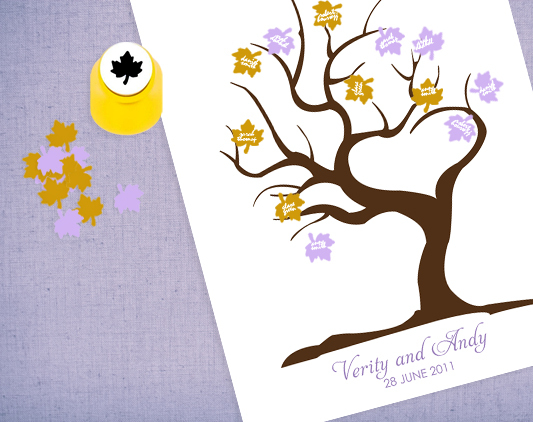 Guests pick a leaf and sign their name on it, then glue it to the tree. Easy! I am happy that I came across this wonderful website!! Keep up the good work guys! !